Stephen Jackson was traded from Golden State along with guard Acie Law to Charlotte for guard Raja Bell and forward Vladimir Radmanovic. 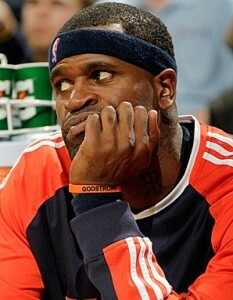 Stephen Jackson was at the center of numuros trade rumors the past few weeks. The Cavaliers were ready to part away with some of their core players for Jackson but at the same time didn’t want to give up size. According to many sources, Cavs indeed had an offer that included Delonte West and a sign and trade for Wally Szczerbiak. Basically the Cavaliers were offering money dump for the Warriors. But the Warriors made it clear they wanted talents and size in return. The Cavaliers were only willing to trade Z only if the Warriors agreed to release him and have him return to Cleveland in 30 days, which is permitted in the NBA under current rules. Charlotte needed to boost their offense after struggling to reach the 80s in five of its nine games so far. Bobcats coach Larry Brown told ESPN.com that Charlotte’s offensive struggles factored heavily into the decision to make the deal. “I know Stephen, he loves to play, and we’ve got to make it work out — and I’m confident it will,” Brown told ESPN.com’s Chris Sheridan. “Stephen gives us a lot of flexibility, but we lost a lot. Raja’s probably as good a defender as there is in the league at his position, and tough, and Vlade was an unbelievable teammate. But you make a trade and hope it helps your team, and you hope it helps the other team, too.